In Iowa’s Great Lakes region, investment property and vacation homebuyers make up a very large portion of the real estate market. 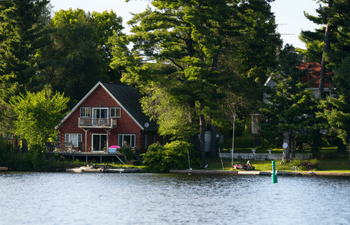 Demand for vacation homes and part-time rentals has remained unchanged in this popular summer destination, and the area has been a hotbed for development in recent years to accommodate the growing need for more properties. If this is your first time buying a second home, there are some important things to consider before you start looking at properties. If you’re buying a home in a seasonal area like Okoboji, the market conditions can vary quite drastically depending on when you’re looking to buy. If you’re thinking about buying a place with the intent of enjoying it right away, then Spring or Summer would be a good time to start looking for a mortgage and browsing what’s available. If you can hold off for a few months to ensure you’re shopping during the shoulder season when the market is a little less competitive, then late Fall or Winter might be better suited to your situation. It can be really easy to get caught up in the moment when you're on vacation. Picture this: you've spent two weeks fishing, sailing, and relaxing by the water. You've just spent a memorable two weeks in the Great Lakes region and can't wait to come back next year. Are you looking for a second home to enjoy for six months of the year or something you can rent out during the busy season to help subsidize the mortgage? Are you dreaming of a lakeside property with a private dock, or simply a convenient condo a few blocks down the road from the water? Is it important to you to be within walking distance to activities and amenities for kids? Or are you more interested in a quiet, serene setting away from the hustle and bustle of tourist attractions? Answering these questions can help you narrow down exactly what to look for. Just because you own the house or condo, doesn't necessarily mean you can rent it out when you want to. Some buildings or neighborhoods have rules in effect to prevent units from being used as short-term rentals. If your intent is to rent it out part-time, then always make a point to ask if rentals are allowed. Just like buying your primary home, you’re likely going to need to put 20% down on your second home as well. It’s not mandatory to have the full 20 percent to put down, but you’ll have a much easier time of securing financing than you would without it. Also, it can be a good idea to use a local real estate agent and local lender to score their area expertise. Once you have an idea of what you want and how much you can spend, the next phase is to start looking at what's available. A full-time Okoboji real estate agent can point you in the right direction, find out about properties before they're even listed, and negotiate with the seller when you find a place you love. Not only are they the professionals you need in their field, but as full-time residents of they know the ins and outs of the market, culture, trends, and more. They’re more than just your agent or broker, they’re your go-to source for local tips and info too, especially when you’re new to the area. Never be afraid to use them as the great resources they are! Your overall satisfaction is their top priority, and they enjoy welcoming new faces to the area and talking about their favorite places to eat and things to do in town.